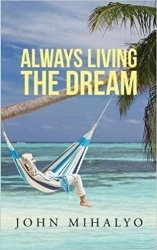 Author John Mihalyo Announces the Release of His Recently Published Book, "Always Living the Dream"
"Always Living the Dream" is written by a first time author, John Mihalyo. The main character in the book, Jake Million has the courage of a Rocky Balboa and the suave demeanor of a James Bond. Jake is a man every other man wishes they could emulate. All must get to know him. Seminole, FL, February 20, 2018 --(PR.com)-- Jake Million is living the life he has always desired. He is retired and is physically and financially able to "Always Live the Dream." This being said, he's never let go of what is most important in his life, the Four F's, Faith, Family, Friends and having Fun. Thus, the book describes the happenings and "isms" that only Jake can tell in his own unique way. Jake Million is an easy going guy who has the courage to stand up for what he feels is right. He is a good looking 60 plus year old retiree. He is college educated with an advanced MBA degree. He is a veteran who served in the military and received an honorable discharge. Now that he is retired the time has come to "Always Live the Dream" as he sees fit. Thus starts a new era in his life and things really get interesting. Move over Rocky Balboa and James Bond, Jake Million has arrived. One reviewer describes the book as "Inspirational, Jake reminds readers of what we should all know and practice, faith, love and respect. A good read but a better example of how life should be lived. If only we can learn."